MADERA, CALIFORNIA (June 29, 2017) – 2015 RPM Mortgage Pro Late Model champion Buddy Shepherd of Bakersfield sent a strong message to the MAVTV-televised field on Saturday, dominating en route to $5,000 and the 125 lap Summer Speedfest victory at Madera Speedway. Shepherd's win is his third so far in the five races of 2017. An all-new podium greeted fans of the 51FIFTY Energy Drink Jr. Late Model series as well in a busy night at the one-third mile oval. Shepherd led 122 laps and endured countless restart battles with June series winner Logan Zampa of Napa, CA in the process. The two high schoolers were the class of the field throughout the evening. Zampa led the first three laps before Shepherd led by a nose at the conclusion on lap four. A big melee on the backstretch included Shelden Cooper spinning and several cars suffering varying impacts including Quintin Harris, Thomas Suarez, and Mark Squadrito. Shepherd picked the inside for the restart and rocketed ahead of Zampa as much of the leaders scrambled to the outside line. Henk Gaalswyk spun in turn four but did a complete 360 and continued on. Jr. Late Model graduate Jarrett Gilmer was part of a wild two-by-two battle for fifth that had him inside Kevin Thompson. Gilmer cleared Thompson and went up high which opened the door for Bakersfield's Racin Vernon. Vernon took fifth on lap 12. Lapped traffic proved a challenge with the big 26 car field as Zampa tried to navigate while fielding pressure from Austin Herzog and Dillon Tucker. The next caution came out for Gilmer spinning in turn two. Tucker used the restart to swoop around Herzog for third before a hard crash with Loren Kutz tagging the turn one gate. Tucker then had to go to work on the inside of Herzog which proved to Herzog's favor as he took third back. 11th starting Matt Erickson cracked the top-five and went after Tucker. Tucker, Erickson, and Garland Tyler staged a nice battle for the position after a series of cautions that brought the race near lap 50. On lap 44, Erickson nosed inside Tucker but couldn't complete the pass before a lap 45 caution for a spin. Tucker finally got the positioning he needed to get past Herzog for third on the outside with Tyler and Erickson also fixing to do the same. Herzog fell to fifth before sliding up in front of Erickson. At the race's lap 75 break, Matt Erickson changed a right front tire and had to restart at the rear of the field. After a pair of cautions for spins, a surprise as Modesto's Kyle Gottula had charged the rear of the field and emerged in fourth position ahead of Tucker. Gottula had a significant crash in practice that set his weekend backwards and required him to start on a provisional. Gottula went after Herzog for third on lap 83 but they made contact and Gottula fell back by five car lengths. Kevin Thompson was engaged in a wild battle right in front of the hard charging Erickson. Thompson's night ended with a hard crash in turn three that included Glen Cook. Gottula got another shot at Herzog and took advantage to take over third just past lap 100. A tremendous three-way battle involved Tucker, Erickson, and Tyler for fifth that thrilled the fans for several laps. Things to heated involving Gottula and Herzog for third when they tangled in turn one and Gottula did a complete 360. Both cars continued but the caution was thrown and both cars had to restart at the rear with five laps to go. Shepherd tried both the high line and the low line during the numerous restarts. His final attempt on the outside snookered Zampa, who was overhauled by Tyler for second. Howard Holden had run around tenth throughout the event and suddenly found himself alongside Tucker in a spirited battle for fifth. Shepherd took the comfortable $5,000 victory ahead of Tyler, Zampa, Erickson, and Tucker by a nose over Holden. Herzog drove back to eighth at the finish. In 51FIFTY Jr. Late Model competition, Jesse Love IV looked poised for his fourth win as he snatched fast-time away from Kolby Berry who had gone 4-0 in qualifying in 2017. But a trio of new faces emerged with Eric Nascimento, Jr. getting his first win with Bakersfield's Kabe McClenny a career best second and Danville's Anthony Guiamano a career-best third in the 75 lap race. The young drivers are to be commended for handling near 100 degree temperatures at race time. Love led from the get-go after winning the pole in the redraw. Tanner Reif of Las Vegas slid up into the third position past Berry after a series of early cautions. Love jumped out to a five car length lead on teammate Hailie Deegan who anchored a five car pack for second place. A second pack included Nascimento who had puffs of smoke from mechanical problems from earlier in the weekend. As the sun began to fall behind the speedway on one of the hottest nights of the season, drivers continued to noticeably fight loose conditions. Berry began to challenge Reif for third as he felt pressure from behind him with McClenny. Berry and McClenny both drove by Reif, who then was passed by Nascimento also. Reif dropped back to sixth in front of Idaho's Zach Telford. Berry was the car on the move until a caution flew on lap 19 for Reif spinning in turn four. Berry used the restart to snooker Deegan for second and continue his march forward. Deegan was passed by McClenny before a caution involving Allison Gay and Jesse Burks. Nascimento jumped inside McClenny for third but McClenny held the outside for several laps to defend the position. Berry hounded Love and gave him a shove on lap 30. Four laps later, Love went up the track in turn four and surrendered the lead to Berry. Nascimento jumped on top of the top-two in a three car duel in the final ten laps of the opening segment. Deegan was involved in a significant crash in turn one with lapped car Allison Gay and Telford that ended the first 50 lap segment two laps early. Coming out of the break, Austin Edwards, who had run as low as tenth, briefly challenged Anthony Guiamano for fifth. That battle for fifth increased to a four car battle about half a track behind the top-four leaders. Love stayed glued to Berry's bumper and on lap 61 the duo came together with Berry spinning in turn four. Both cars had to restart at the rear. Nascimento assumed the lead ahead of McClenny and Guaimano and the trio never looked back. Austin Edwards came back to fourth with Deegan coming back for another top-five as well. Kolby Berry finished eighth with Love in ninth in a big shakeup for the points standings as well with three rounds to go. The Mini Cup feature may have stolen the show with Tyler Reif of Las Vegas getting a crowd-pleasing win after battling hard with Joey Stearns of Stockton. Stearns led the opening five laps with Reif in tow. Reif tried several maneuvers before they collided twice in turn three sending Stearns for a spin. Both drivers had to restart the 20 lap feature from the rear. Aiden Phillips led three laps before Stearns and Reif were back up front again. This time Reif spent many laps seizing up Stearns until they started a door banging duel that lasted two laps side-by-side. After a few hard lumps and door banging, Reif took over on lap 16 and never looked back over Stearns, Phillips, Kale McClenny, and Joseph Holliday. A tremendous 10 car turnout of combined Toyota Sedans and F4s gave the race fans plenty of side-by-side racing. Jason Kearns led the first six laps before a caution brought the field back together. Former open wheel standout Tim Skoglund of Fresno parted the seas to take the lead before points leader Mike Marley challenged. Marley peeked inside on lap 18 but couldn't complete the deal. Skoglund successfully drove away from Marley for a 1.123 second win followed by Jason Lawton, Jason Kearns, and Tim Curtis. 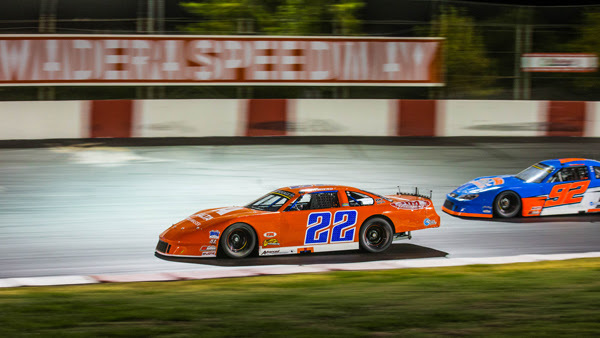 Up next for Madera Speedway is the Children's Hospital Kids Night Presented by JBT FoodTech this Saturday! It will feature Madera Late Models, Madera Hobby Stocks, F4's, Toyota Sedans, MST, and the Jr, Late Model 25 lap exhibition race.